Are DeSean Jackson's Drops a Major Problem? Pro Football Focus had a report earlier this week that got a lot of traction, detailing the NFL wide receivers with the best and worst hands in 2010. In it they broke down receivers by “drop percentage,” the number of drops a receiver made divided by the number of catchable passes (drops + receptions). A surprise to many Philly fans, DeSean Jackson led the way with the worst drop percentage in the league among wide receivers with at least 50 catchable balls thrown their way. They counted 12 drops out of 61 passes, for a percentage just under 20 percent. In other words, DeSean dropped one out of every five balls — which is appallingly high. Regardless, the immediate reaction of a lot of folks, including myself, was to dismiss the report entirely. After all, Jackson spends a large number of plays streaking down the field. Those long passes have to be harder to catch. But when I actually went and looked at the numbers (also from PFF), it turns out deep passes weren’t really the problem last year. Take a look at the chart below. DeSean only dropped two deep balls out of 15 possible in 2010. That’s not a fantastic rate, but it’s in line with his previous two years. The real jump, however, came on short passes. In theory, those slant routes and other underneath targets should be easier to catch. Yet Jackson dropped more than one quarter of them — way higher than his previous two seasons. Suddenly DeSean’s deep ball excuse isn’t so convincing. It looks like he truly does have poor hands, at least compared to the average NFL wideout. But while it’s something to keep an eye on and an aspect of his game that he needs to improve, these bad drop rates still probably aren’t a huge problem. Because these are all small sample sizes, a drop here or there will matter a lot — especially when the difference between a drop and an uncatchable ball could be disputed. Jackson had a lot more drops in 2010 than 2009, but there’s no reason that couldn’t shift back toward the mean next season — whenever that season eventually happens. 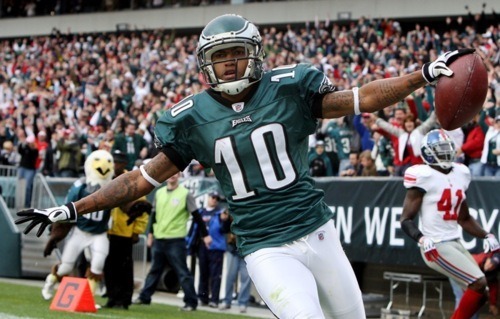 Tagged with Philadelphia Eagles, DeSean Jackson, Wide Receiver, Statistics, Pro Football Focus, Receptions, Drops, Catchable Passes, Passing Game, NFL. May 26, 2011 by Brian Solomon.